"If the purpose of marriage was simply to enjoy an infatuation and make me 'happy,' then I'd have to get a 'new' marriage every two or three years." That's a quote from Christian author Gary Thomas in his book, Sacred Marriage: What if God Designed Marriage to Make us Holy More than to Make Us Happy? But wanting to be happy is human nature! I was so disillusioned when James and I shared one tube of toothpaste after our wedding. I (and he) couldn't believe we would told each other we were wrong. "Why are you squeezing in the middle? You are destroying my toothpaste." "It's too slow to squeeze from the bottom! That's so dumb!" Each of us were dumbfounded (because we never argued once in our three months of dating). 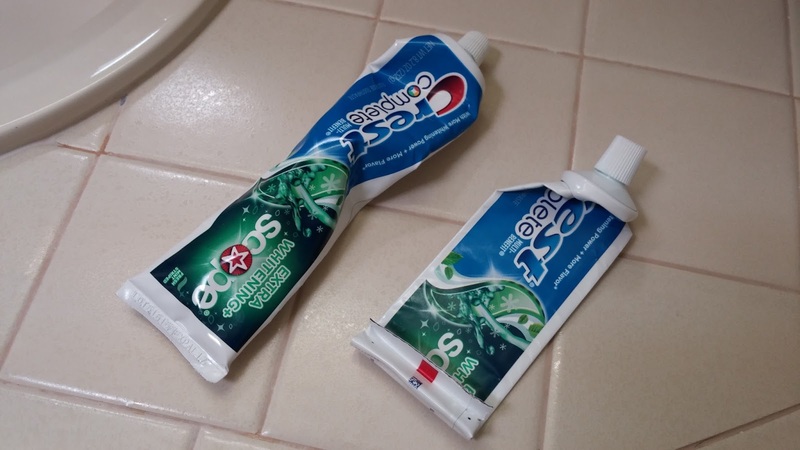 To solve the problem, James quickly bought another toothpaste so that each of us can squeeze our own way. But I was still hurt. Fast forward. Toothpaste is not an issue as we freely share one (while travel) or two tubes. At home, every time when mine is almost out, I would swap mine with his. When he finishes up his tube, I start a new one and give my crumbled up tube to him. It works. I feel loved. We all seek that elusive quality of “happiness.” Here are some things you can place your awareness on and STOP so you can be happier. 1. Impressing. What you have —your possessions, your accomplishments—don’t result in real relationship or lasting happiness. 3. Controlling. It doesn't help you feel good about yourself. Honor your boundaries, but make space for others' needs and choices, too. 7. Being Ungrateful. Stay aware of all the gifts and blessings that you do have. Express gratitude and happiness will follow. 8. Preaching/Lecturing. Another form of judging. Find more fun and empowering ways to share your knowledge. 9. Negative Self-talk. Train yourself to notice your mind's chatter. Working towards changing negative thoughts to positive ones will transform your life. 10. Fear. Don’t let fear get in the way of progress. Whatever you’ve been dreaming, get going on it. "Feel the fear and do it anyway." Talking about clinging to what is known... How about trying to love someone the way he or she can feel your love? The couple was in distress over their teenage daughter. Mom lamented, "I cooked, cleaned, drove her to school, shopping, everywhere. I do things for her all day long and she doesn't appreciate me one bit." Her husband added, "She asked me to help her with homework at the last minute, then she questioned my logic and got mad at me!" These parents were clearly hurt, frustrated, and feeling taken for granted. We all know or have shared similar stories about our kids (especially teenagers) at one time or another. Are today's young people just selfish, inconsiderate, and ungrateful? Will they ever understand and appreciate our love? May be they don't feel loved? Feeling loved is the most basic human need. We have heard how premature babies would grow better if they are consistently held and talked (or sung) to. Some adults may feel unloved even though their spouse kept saying, "Of course I love you, don't I work very hard to provide for you?" or "What do you mean not loving you? I am exhausted doing this and that for you and our family!" Jesus taught, "Love your neighbor as yourself" (Matthew 19:19) and "So in everything, do to others what you would have them do to you" (Matthew 7:12). How then shall we love one another if each of us secretly wish that someone would love us in a particular way that is personally important and meaningful? Author Gary Chapman wrote a series of books on "Five Love Languages" about communicating love. Each person has his or her own dominant (primary and secondary) love language(s) on the receiving end. In other words, each of us crave for something different -- Words of Affirmation, Quality Time, Acts of Service, Physical Touch, and Gifts. When love is "spoken" to us through our one particular language, we "click" with the sender and feel loved. For examples, the son who keeps on yelling, "You don't love me" may be craving for quality (fun and relaxing) time with his parents for them to listen to his fear, anxiety and dreams instead of nagging and lecturing. If someone complains, pay attention. Mom may need some acts of service while Dad may be asking for respect and affirmation for trying hard to solve problems. Children will grow up and leave couples with an empty nest. That is why parents have to support and refill each other's emotional love tank by having regular dates and quality time away from their kids. On this coming Valentine's Day, take your mind from all the negatives and make a list of positive things you like about your family. Do more of what works and stop things that don't work. Encourage and affirm each other for the efforts you have put in, listen to each other's feelings, hug and kiss one another, tell each other "I love you," and buy your wife a gift that connects to her heart. Emotional love tanks need to be refilled constantly. Every negative interaction may cancel out 5-7 positive interactions. Do not get upset when your kids say, "You don't love me!" Listen to their feelings and show empathy. Try different ways to express your love until they get it. There is a Chinese saying, "You will only understand parental love when you parent your own child." We can all hope that some day our kids will look back and understand our love and sacrifice. However, why wait if you can love and feel loved now? Try a different love language today! Gary Thomas said to a young friend, "If you want to be free to serve Jesus, there's no question--stay single. Marriage takes a lot of time. But if you want to become more like Jesus, I can't imagine any better thing to do than to get married. Being married forces you to face some character issues you'd never have to face otherwise."